Quiet, vertical multistage centrifugal pump, ideal for pressurization and irrigation. Manufactured with strong materials for a long time operation. Pump designed to work in multiple pump booster set controlled with or without variable frequency drive for fully automatic operation. Made of robust materials and supplied with cast counterflanges for an easy adaptation to the installation.Manufactured with PPO impellers and diffusers and supplied with cast counterflanges for easy adaptation to the installations. Silent ON-LINE pumps for continuous service. Ideal for sprinkler irrigation and pressurization of buildings and small communities. Air-cooled frequency inverters to assemble on motor terminal boxes. Variable frequency drive to control a water-cooled pump with supply power in single-phase or three-phase. 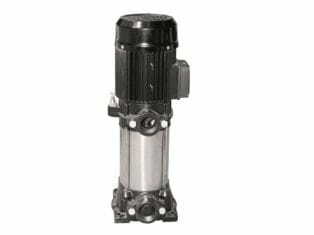 Quiet, vertical, multistage centrifugal pump, ideal for pressurization and irrigation. Manufactured with strong materials for a long time operation.